Minimally invasive hernia surgery is a field of general surgery that should be understood by the internist. Many patients will ask for guidance on this option. This chapter develops the general preoperative workup, the general intraoperative details, and the postoperative expectations that can be seen following these procedures. In general, the MIS method allows for a faster recovery from the surgery and superior outcomes compared to the traditional open surgical approach. The relatively recent addition of the surgical robot to the MIS repair of hernias has introduced another layer of MIS repair. It should be remembered that the robot is a laparoscopic method rather than a truly new operation. McCormack K, Scott N, Go PM, Ross SJ, Grant A, Collaboration of EU Hernia Trialists. 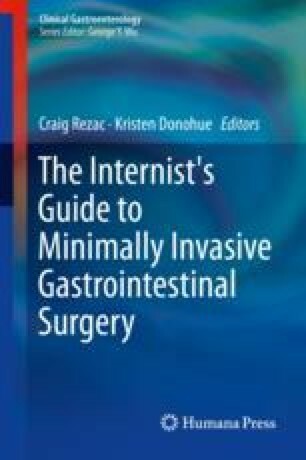 Laparoscopic techniques versus open techniques for inguinal hernia repair. Cochrane Database Syst Rev. 2003;1: Art. No:CD001785. https://doi.org/10.1002/14651858.